Do men need watches anymore? The answer is a resounding yes! Admittedly a wristwatch looks small, yet it can also be stylish, even elegant. Checking the time by glancing down to the watch on your wrist presents a better image than getting out a cell phone to check the time, especially during a business meeting or a job interview – so unprofessional. 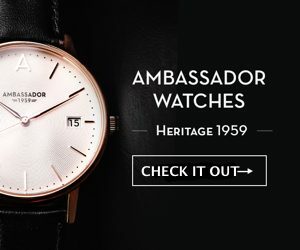 Furthermore, watches have been worn by men for well over a century now, and there are good reasons for that to continue being the case. The reasons why men should wear stylish watches in 2019. Convenience: Wearing a watch on the wrist is easily the aptest place for a man to place it. It is so simple to look down at the wrist or to raise your arm to eye level. Such watches remain the best style for men. Checking a watch has so much more class than looking at a phone. The great advantage of the wristwatch design is that it leaves your hands free. It takes no effort at all to lift your sleeve to look at the time or to move your wrist to eye level. Watches are safer and more reliable for giving you the time than any phone ever could be. Provided it is looked after a watch will keep the time accurately for years. Unlike a phone the battery in a watch does not run out at the worst possible moment. Need to catch a flight, get to a meeting or go on a date? Then check your watch and not a phone. Compliments: Many people are slow to realize how many compliments a stylish watch will earn them. A nice looking men’s watch puts a sophisticated touch to whatever outfit you are wearing, and will gain attention for the right reasons and not for the wrong ones. After all it is better to get noticed for wearing a good quality than it is for looking at your phone during a meeting. High Quality: It is worth investing in a quality wristwatch, as one will last longer than most phones or other electronic devices will. A well-made watch is carefully designed and well crafted by the hands of a skilled watchmaker. If you buy the right watch it is a good long term investment. A well-chosen quality timepiece will allow you to look the part at any meeting, going well with a sharp suit, smart shirt and highly polished shoes. The right watch can demonstrate that you mean business at the aptest times and that you are in control of everything that you need to be in charge of. You can even customize your watch to look and work the way you want it to. It is how you want it in particular and it looks great. Watches are not just style for men, they can be styled specifically for you.